She is an evil elven enchantress. 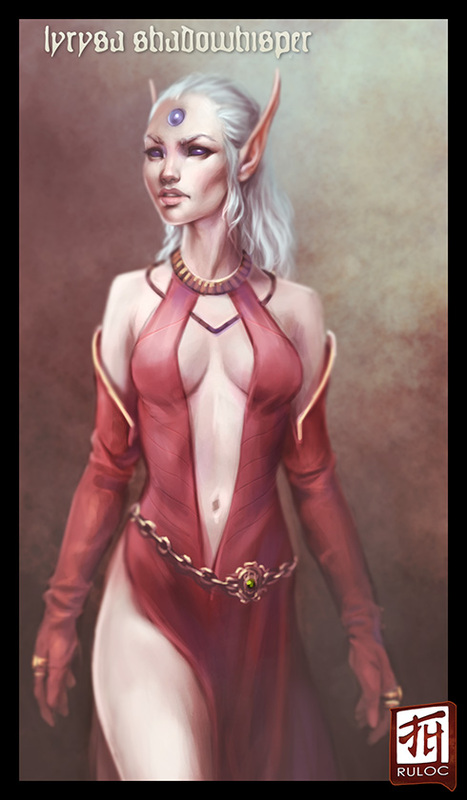 Light skinned (almost pale), long silver colored hair (waist length, flowing), dark purple eyes (Golarion Elf style). Style of dress would be seductive in nature, feel free for creative license on this and modify it. What I picture is a lowcut top, sleeveless but long gloves, with a skirt long in back, just above the knees in front, split on both sides. Boots coming up to around the knees. A gold chain belt surrounds the waist with a golden tiara, a gem in the middle at her forehead. Rings on fingers. A sword (either Longsword or Rapier) can hang from her side if you want to include it, though mostly decorative.